Bees are terrifying. Something about them bypasses all reason and sends the brain directly into panic mode, despite their size. Actually, now that we know this story, their size makes them even scarier. In short, doctors in Taiwan found four bees in a woman's left eyelid. She was experiencing pain when she was cleaning a gravestone, the New York Times reports, and thought she'd gotten sand in it. She rinsed her eye with water, but it kept swelling. After three hours, she finally went to the hospital. "It was very painful. Tears wouldn't stop coming out of my eye," she said, according to CNN. "I was scared to death." Doctors found the four bees and a bacterial skin infection called cellulitism, plus corneal erosion. 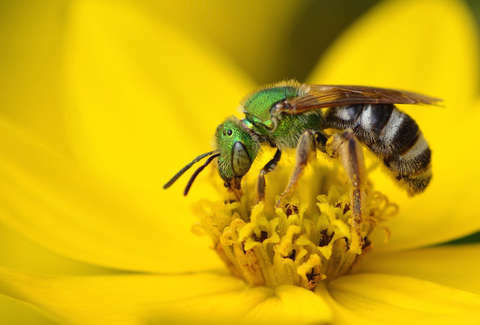 Halictidae, also known as sweat bees, are around 3 to 4 millimeters long and live off the salt that comes from human and animal glans. "I saw something that looked like insect legs, so I pulled them out under a microscope slowly, and one at a time without damaging things inside," said Hung Chi-ting, the head of the ophthalmology department at Taiwan's Fooyin University Hospital, at a news conference. Because she was able to refrain from rubbing her eyes, the bees were still alive and intact. She's reportedly expected to make a full recovery. Whether anyone will ever be able to sleep again knowing this is possible is another question.